There’s nothing better than a man on the internet doing crazy cool things and offering it for free for the world to see. One of these men is Rick Beato, a musician, engineer, producer, and your new best friend. Rick is sort of a whiz when it comes to music theory and recording techniques. It’s sort of hard not to find a subject he hasn’t done a video on. In this particular video, he gives us the skinny on re-amping thick guitar tones, using Meshuggah’s “Lethargica” as his guinea pig. Now I know what you’re thinking: Just throw the track into a top of the line guitar FX rig and you’re good to go! No. Not this time. Rick here is the real deal, so he shows us how to do it the real way. He uses 100 percent outboard gear. Real amps, real mics, real EQ’s, and real mic preamps. And he goes through the entire set up, from his signal flow, showing exactly what gear he’s using, explaining why he does what he does, and giving A/B comparisons so you can hear the difference it all makes. I feel like I learned more about recording guitar from this 9 minutes than I did when I learned what I did in college. He even shares things that you wouldn’t think make a difference, but when putting it into practice, it’s night and day (the overdriven guitar section towards the end was primo). 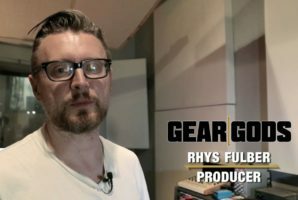 If you have any interest in learning what it takes to record guitars through a real analog set up, you can’t get much better than ‘free on the internet’ that this video offers. Rick “The Workhorse” Beato is amazingly active on his YouTube channel, posting all sorts of quality, music-related content pretty much daily. Check it out for yourself if you know what’s good for you. Rick also has a slick website with exclusive courses not found on YouTube, if you’re interested at being the best you you can be, go visit sometime and say a good hello.